The more time I give myself for play like this the better my thinking, my connection making and idea generating get. 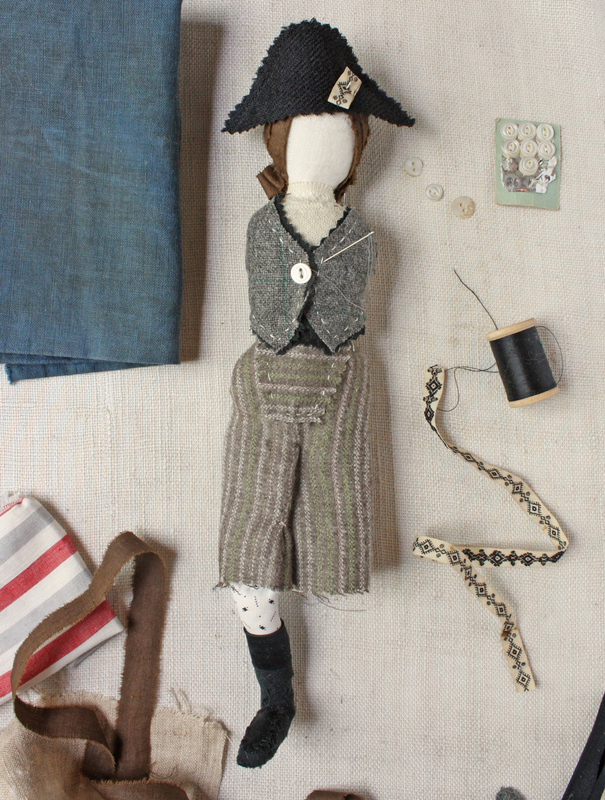 While messing around with these dolls I have had one million ideas. This kind of experimenting is like giving my imagination vitamins. 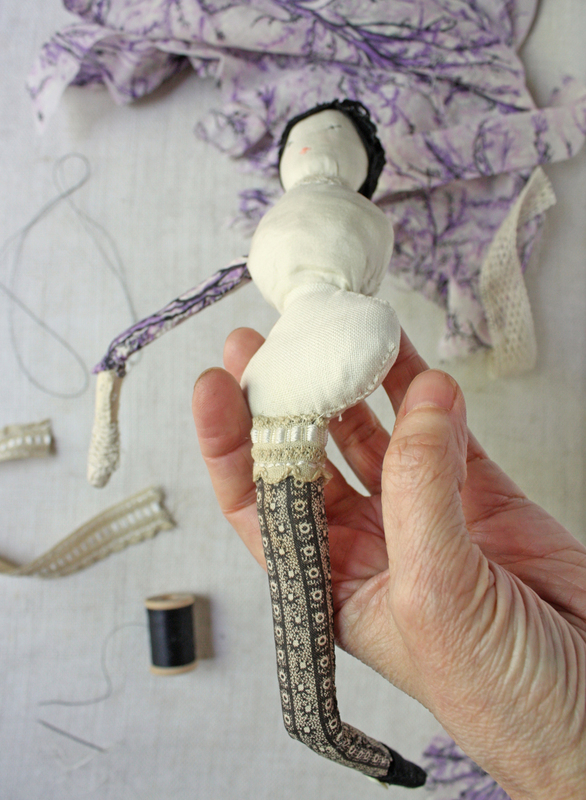 It is not an efficient way to make a doll, and I get frustrated in the process sometimes (it takes a while to shift out of expectations and perfectionist thinking and into curiosity) but it never fails to get me to new places. In trying stuff – stuff that works and stuff that doesn’t – I make connections I would not have otherwise made and connections are where ideas come from. I experimented with a bunch of stuff for making arms and legs and landed on something simple I like. I’ve made her arms and legs in two sections upper and lower from the paper covered wire. Each section gets covered with batting and then covered with fabric. I left a little extra at the ends so they would be easy to join and nice and bendy. The legs are made the same way and I added a little lace to the top before attaching by whip stitching to the bottom of her torso with sturdy thread. I like her spidery arms and legs. I’ll leave her for now and show you progress on the other girl who is no longer a girl. While I was playing with making hair she turned into a he – a soldier. The hair is torn strips of thin cotton stitched to the head with a running stitch. I made loose pleats with the bottom ends for his curls. I wan’t planning on a soldier but that’s who turned up. 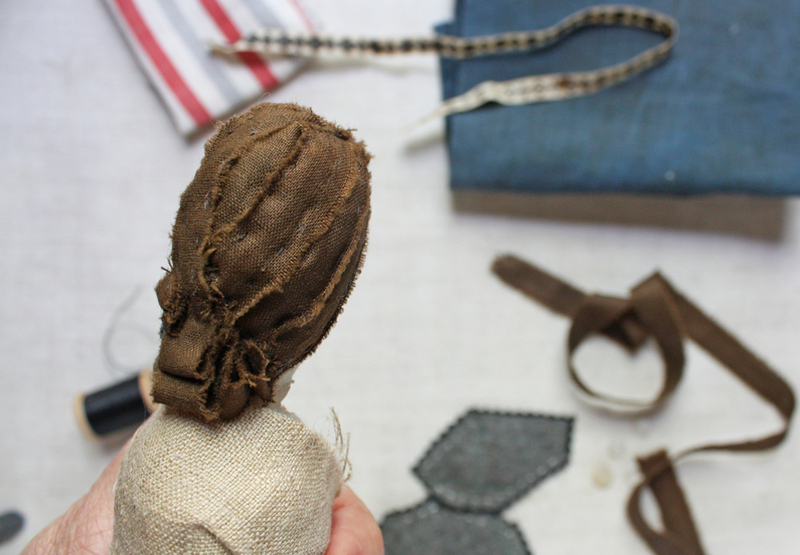 I’m having a blast making his clothes and have become obsessed with military uniforms – so many surprising shapes and details and layers….. I so wanted to finish them for today but I’m not even close – I’ll update here or in a new post in a day or two. And I’m not done experimenting – there will probably be a part three. 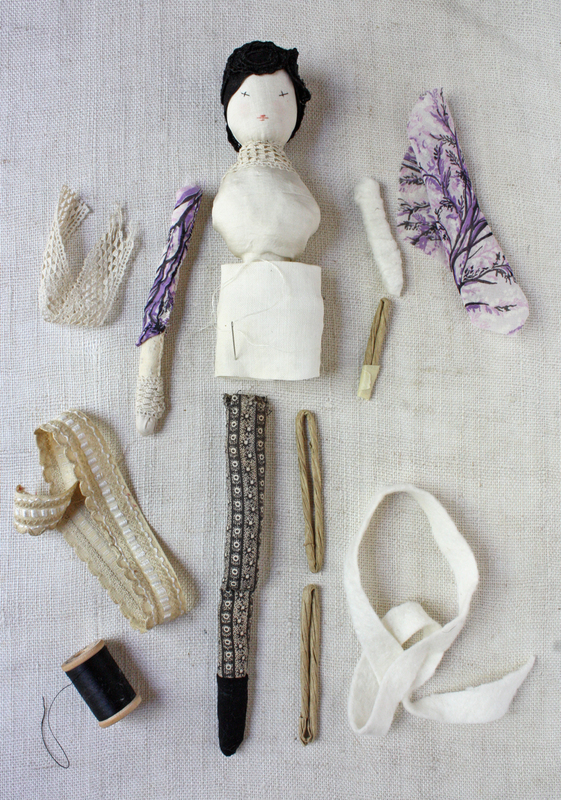 Thanks to everybody who has sent photos of their experiments or posted to instagram #improvisationaldoll. If you like you can email photos to info at ann wood handmade dot com. Ann she is beautiful! So interesting-Love what you do to make all your doll’s hair. Your web site is a mini vacation. Such inspiration and great patterns. Hi Sharon – Thanks so much – I like her too! Neither doll is what I was expecting – they feel a little like a mini vacation to me – something new around every corner. Your work is so inspiring. I haven’t made anything since the Sweet Paul Makerie with you in Brooklyn. My twin sister and I thank you for the lace scraps you offered us. We are hoping to make our ships from your pattern I purchased…..but now I want to make a doll 1st. Hi Joanne – the makerie…. that was so good – I wish it could have lasted a week. Too many things to make – that is an excellent dilemma ! Wow Ann, your work is so amazing. Love seeing the different steps and so intricate details they go into making one of tiny creations. It is exciting to watch these dolls become! I’m never quite sure who is directing the creative process; me. or the doll. Very inspirational! I really like your work. 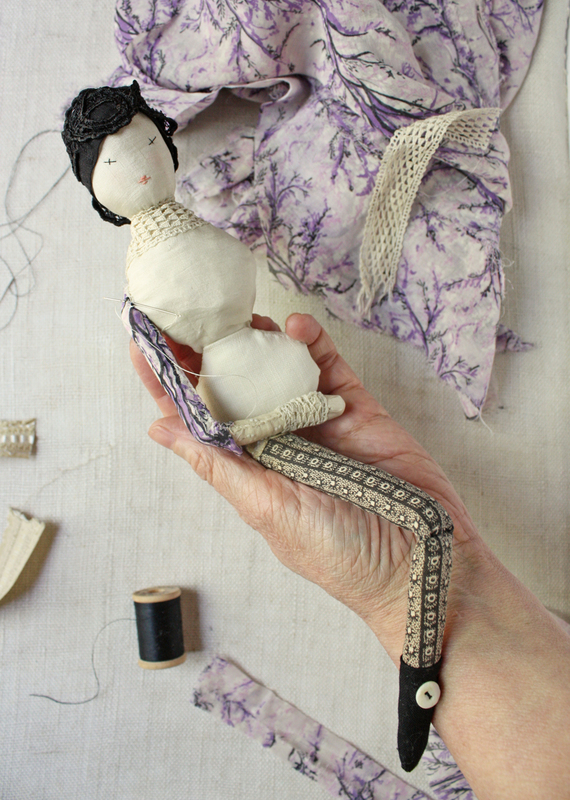 I don’t think I want to make any dolls, but it’s so good to read about your working process. When I see your creations I have the impression that everything always goes easy and great. So for me it’s so good to hear that even you make mistakes and that they are part of the process. And here I was thinking your soldier was a lady pirate to command your fleet of ships, oh well!